Weddings are wonderful events, even without the decorations and bling, though most brides deeply desire a beautifully decorated wedding and reception. Save money with these cheap wedding decoration ideas. These cheap wedding decorating ideas can help you plan a beautiful wedding and still have money left over for the honeymoon. The best way to save on wedding decorations is to pick a fabulous location. After all, if the setting is gorgeous, you shouldn't have to do a lot to enhance the space. However, if you are planning a wedding on a tight budget, it's certainly not going to be feasible to rent a vineyard in Napa. 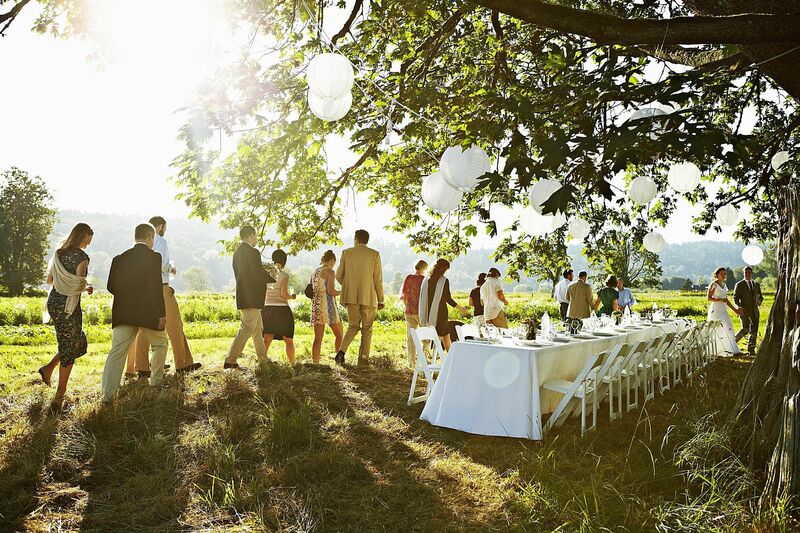 Consider a bed and breakfast, a public park or an art gallery for a wedding and reception. Or go rustic! If you can get outside of the city, you may save thousands. Country settings and small-town locations are usually much less expensive than big city venues. He Loves Me Not...He Loves Me! Flowers dress up any occasion, and they don't have to be expensive. Or forgo greenery and save even more - cut branches with twinkling lights or baby's breath can be a fabulous substitution for expensive flowers. Check out these fun DIY floral decorations that would be perfect for a wedding or reception. Twinkling lights or the glow of candles can add instant (and inexpensive!) charm to a sunset or nighttime wedding or reception. But don't discount the allure of lighting during the daytime hours, especially if your venue is indoors or shady. The wedding tables can cause a lot of stress. Following a decor theme and rental costs can cause budget dilemmas. Many couples forego traditional seating and opt instead for several food tables amongst scattered seating. Whether you need seating for 150 or only need to dress a few buffet tables, this fun, and frugal ideas may help. If only finding the groom was this easy! Signs not only add whimsy to a wedding and can help point the way toward the ceremony or reception, but they can serve as wonderful decorative mementos to the day you say "I do." ...free, of course! The advent of premade printables has made expensive wedding booklets, favors and other wedding paper goods extremely inexpensive. Here are some great resources for free printables for your wedding. You may not have a lot of time before your wedding to get crafty so enlist bridesmaids, friends and family members to lend a hand. If you like a handmade look but the wedding date is closing in fast, check Etsy and other online retailers for frugally priced items.